In this eye-opening account, Cal Newport debunks the long-held belief that “follow your passion” is good advice. Not only is the cliche flawed-preexisting passions are rare and have little to do with how most people end up loving their work-but it can also be dangerous, leading to anxiety and chronic job hopping. Matching your job to a preexisting passion does not matter, he reveals. Passion comes after you put in the hard work to become excellent at something valuable, not before. In other words, what you do for a living is much less important than how you do it. With a title taken from the comedian Steve Martin, who once said his advice for aspiring entertainers was to “be so good they can’t ignore you,” Cal Newport’s clearly written manifesto is mandatory reading for anyone fretting about what to do with their life, or frustrated by their current job situation and eager to find a fresh new way to take control of their livelihood. He provides an evidence-based blueprint for creating work you love. 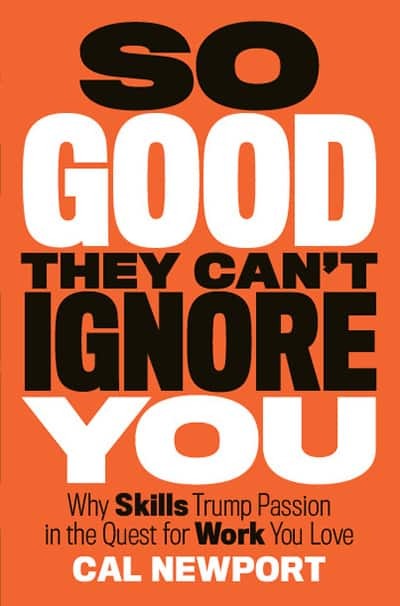 So Good They Can’t Ignore You will change the way we think about our careers, happiness, and the crafting of a remarkable life. Here’s the book I truly wish I could read when I was a teenager or in the university. The heart-felt advices and suggestions are most valuable for anyone who has any tiny little doubt about what his/her passion is. Passion is tricky and subtle because not everyone knows exactly what s/he loves to do throughout the entire life. If you think you know what your passion is, that’s great! And if you are happy about that, even greater. While I happened to be one of the guys who didn’t really know what they want as young men. And I’m sure I was not the only one out there. Passion may be easy to talk about. Yeah I love this and I love that. But you can only talk about it in reflection, not in premonition. 1) Passions are facilitated, not pre-defined. Nature vs. nurture. Passion is not something that’s born with you. Don’t tell me you knew exactly you wanted to be an engineer when you were one day old. Passion is the result of complex synthesis of factors of both nature and nurture. If that’s the case, you can’t FIND your place in the cycle of life, you can only EXPLORE it. Passion is not something you can find. It’s something you can explore and then define. There may be things that you cherished so much in the past but no longer now. Life is full of premises and compromises, some of which create new context for a new passion. Even passion needs re-positioning once in a while. Thus, the thing about passion is NOT about following your pre-defined passion where your heart lies – your heart lies nowhere until you define it. Passion is NOT about matching your criteria with the world, but about embracing the world to define your criteria.